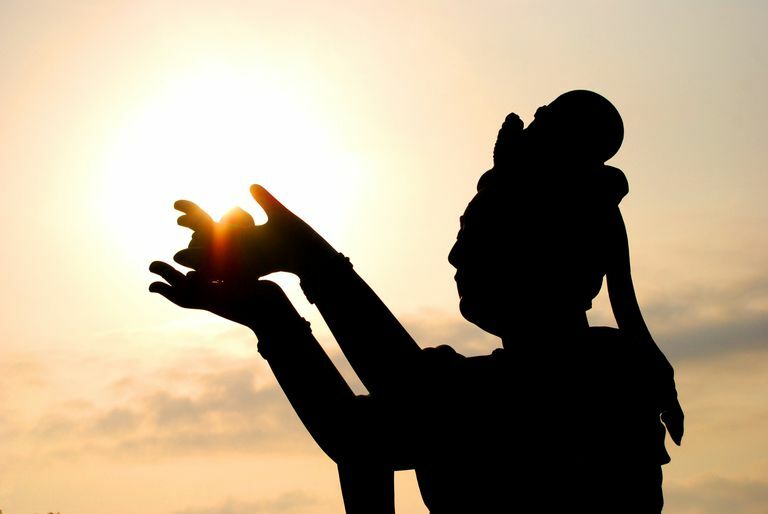 One of the six Devas at the Tian Tan buddha on Lantau Island at sunset, Hong Kong. In Mahayana Buddhism, the ideal of practice is to become a bodhisattva who strives to liberate all beings from the cycle of birth and death. The Bodhisattva Vows are vows taken formally by a Buddhist to do exactly that. The vows are also an expression of bodhicitta, the desire to realize enlightenment for the sake of others. Often known as The Greater Vehicle, Mahayana is quite different than the Lesser Vehicle, Hinayana/Theravada, in which the emphasis is on the individual liberation and the path of the arhat. "Not until the hells are emptied will I become a Buddha; not until all beings are saved will I certify to ​Bodhi." Buddha's way is unsurpassable, I vow to become it. "I have heard people say, 'I cannot recite these vows because I cannot hope to fulfill them.' Actually, Kanzeon, the incarnation of mercy and compassion, weeps because she cannot save all beings. Nobody fulfills these 'Great Vows for All,' but we vow to fulfill them as best we can. They are our practice." "When we take these vows, an intention is created, the seed of an effort to follow through. Because these vows are so vast, they are, in a sense, undefinable. We continually define and redefine them as we renew our intention to fulfill them. If you have a well-defined task with a beginning, middle, and end, you can estimate or measure the effort needed. But the Bodhisattva Vows are immeasurable. The intention we arouse, the effort we cultivate when we call forth these vows, extends us beyond the limits of our personal identities." "Taking the vow is like planting the seed of a fast-growing tree, whereas something done for the ego is like sowing a grain of sand. Planting such a seed as the bodhisattva vow undermines ego and leads to a tremendous expansion of perspective. Such heroism, or bigness of mind, fills all of space complety, utterly, absolutely." Therefore, in Tibetan Buddhism, entering the Mahayana path entails a willful exit from the Hinayana and its emphasis on individual development in favor of pursuing the path of the bodhisattva, devoted to the liberation of all beings. Shantideva was a monk and scholar who lived in India in the late 7th to early 8th centuries. His "Bodhicaryavatara," or "Guide to the Bodhisattva's Way of Life," presented teachings on the bodhisattva path and the cultivation of bodhicitta that are remembered especially in Tibetan Buddhism, although they also belong to all of Mahayana. There is no clearer explanation of the bodhisattva path than this.